All life on earth and all activity in the atmosphere depends upon energy from the sun. A tiny percentage of the energy produced by the sun reaches the earth in the form of short wave radiation known as solar insolation. Study the diagram on the right carefully. Make your own copy. 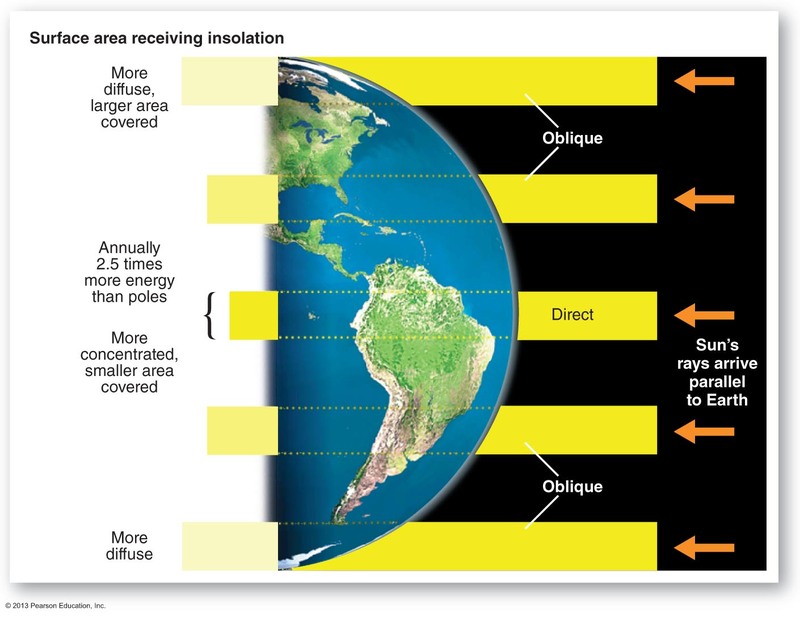 What percentage of the incoming solar radiation is absorbed by the earth's surface? Draw a pie chart or a divided column chart to show a breakdown of what happens to the incoming radiation. An average of 6.7% of the sun's energy is reflected back into space but the actual amount reflected at different locations varies depending upon the surface. Explain in your own words what is meant by "albedo". What is a feedback loop? Explain using examples and a diagram. 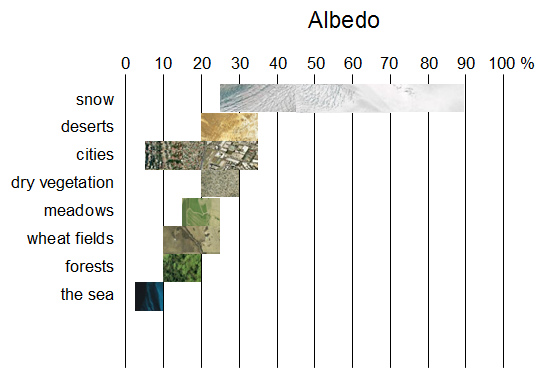 Draw your own graph to show the variations in albedo depending on surface. If climate change leads to melting of glaciers and polar ice, how might this create a damaging feedback loop? What about the consequences of urbanisation and the rapid growth of urban areas? Latitude has a significant impact on the amount of energy reaching a particular location on the earth's surface for two main reasons: surface area and thickness of atmosphere. Study the diagram on the left carefully. Create your own simple diagram which shows why land at low latitudes (near the equator) receive more energy than land at high latitudes (near the poles). Add a layer of atmosphere to your diagram and make sure you have explained both surface area and the thickness of atmosphere through which the incoming insolation must pass. The factors described above mean that some parts of the earth receive more radiation than they emit and other places emit more than they receive. The graph below shows a heat budget for a typical year across all latitudes. Study the graph very carefully before answering the questions. Describe the pattern shown on the graph. How does the graph help to explain that it is much colder at the poles than in the tropics? Using the data from the graph alone, what would you expect to be happening to temperatures at the poles over time? What about the tropics? Is this happening? What factors determine the temperature of the earth? What % of incoming radiation does the earth reflect back into space? What is the wavelength of incoming radiation from the sun? What about the radiation which the earth emits back into space? Describe using diagrams what is meant by “ a state of radiative equilibrium” in the earth’s energy balance. Why is this equilibrium important? ​1. Use this video and the student text book to produce a fully annotated diagram which explains the natural greenhouse effect and why it is so important to life on earth.